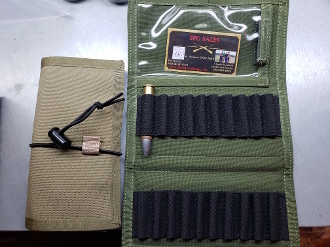 LIMITED STOCK- Ammo Wallet for a secure method to pack your ammo on the hunt or to the range. Elastic loops packs most all ammo. I even stuck a .45-2.6 round in one loop and fit was perfect. Also has window compartment for your range card or permits. Available in OD green or Coyote Tan. Note on Shipping MULTIPLE items NOTICE: Your total shipping charges are based on the shipping method automatically calculated by size and weight, which can make multiple products show a higher shipping fee. Sometimes with multiple products we can ship for less than is quoted on the order form. SPG Sales will reimburse you the difference if we find any over-charge on the shipping and handling costs for your order. We are committed to providing the best possible service to our customers and value your business.